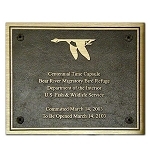 Choose a bronze metal plaque with the rich gold color of bronze with your choice of background color, border style, texture, coating and mounting method. Choose a subcategory first and then make your choices. 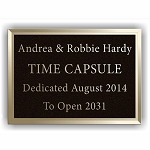 Small plaques are 5x7, 6x8, and 8x10"
Medium plaques are 9x12, 10x12, and 12x12"
Extra Large plaques are 18x18, 20x20, 18x24, 20x24, and 24x24"